Back in 1986 I felt it was time to ditch my FSU mechanical SLR's and get a 'serious' SLR (by 'serious' I think, at the time, I meant 'Japanese'). There were so many choices; I could afford an old Nikon F but wanted a camera that came new in a sealed box. This was the tail end of the days when you chose a camera body that was aperture or shutter priority (rarely did they provide both). Ultimately I decided on the OM2 spot/program partly because it had a beautiful traditional aesthetic with sophisticated metering; partly because, in the UK, David Baily and Lord Litchfield where advertised OM users and they were two of the only photographers I had heard of. Interestingly, at that time a new upstart had been released that would revolutionize cameras but that I dismissed as 'plastic'. If I was going to spend a lot of money I wanted brass and leather not plastic and rubber. 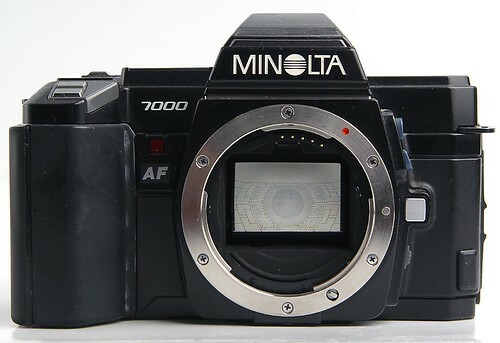 The new kid on the block was the Minolta 7000 and it was the first in body, autofocus SLR. Up until that point manufacturers were being very timid about autofocus technology. A few developed self-contained, autofocus lenses that attached to their manual focus camera bodies. Canon, Nikon, Pentax and Olympus were all afraid to alienate their core constituents by creating new lens mounts that would force their users to upgrade and only by creating a new mount could in-body autofocus cameras be developed. Minolta was not so timid. One could be unkind and say that their relatively unpopular, manual focus, MD system left them with little to loose but Minolta started the autofocus revolution. Canon, Nikon and Pentax raced to play catchup over the next couple of years with the first two overtaking Minolta in the technology stakes by the end of the 80's. Olympus remained reluctant to adopt an autofocus system until it was too late and largely made themselves obsolete in the SLR market. Thinking back to that time I remember the debate about auto v manual focus systems raging as strong them as the digital v film debate rages today. The old school (myself among them then) didn't believe that the camera itself could focus better than a good photographer. We saw autofocus in the same way as a petrol-head sees automatic transmissions; OK for anyone who didn't like driving but not for those who loved real cars. Nikon F (the first 'modern' 35mm SLR - the camera that established Japan as the manufacture of professional 35mm camera systems - Leica and Germany never really recovered from this blow). To this list I would add the Minolta 7000 as the last truly revolutionary 35mm camera. There are more modern, more beautiful, faster and more advanced autofocus , SLR cameras but they all follow the standard that the 7000 set. That standard obviously included in body autofocus. It also included an exposure system that had program, aperture priority, shutter priority and manual 'modes'. It included a lot of plastic but on the plus side it included ergonomic styling, push button controls and full viewfinder information. It was the first, truly modern SLR.